In the event of a sole source determination where only one source is practicably available for that which is to be procured, the City of Harrisonburg will post the determination electronically in compliance with the Virginia Public Procurement Act 2.2-4303. *Note: All Sole Source documents are kept on this page for one (1) month. 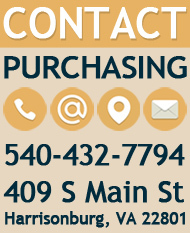 For prior Sole Source documents, please contact the Purchasing Office at 540-432-7794. In the case of emergency, a contract may be awarded without competitive sealed bidding or competitive negotiation; however, such procurement shall be made with such competition as is practicable under the circumstances. In the event of an emergency procurement, the City of Harrisonburg will post the determination electronically in compliance with the Virginia Public Procurement Act 2.2-4303. *Note: All Emergency Award documents are kept on this page for one (1) month. For prior Emergency Award documents, please contact the Purchasing Office at 540-432-7794.